Mariah Carey VIP Tour Merchandise - exclusive to those that purchased the VIP Merry Christmas tickets. Condition new. Photo, scarf, hat and lanyard in Mariah Carey bag. Features: Print on front and back of shirt. Shirt Length: 26”. Material: 100% Cotton. 30" (76cm) x 20" (51cm). Clean and Original - not repro copy. 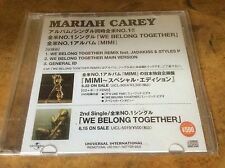 Mariah Carey - We Belong Together - 2005 Japanese Promo only Single.Very Rare. Mariah Carey - Someday - UK 1990 Ltd Edit 4trk Picture Disc CD Single.RARE. Touch My Body - Seamus Haji & Paul Emanuel Radio Edit 3:54. Touch My Body - Craig C Radio Edit 4:02. Touch My Body - Subkulcha Radio Edit 4:34. Mariah Carey - Unplugged - USA Promo Only Video. Extremely Rare. 05 / 18 / 2001. Housed in a black Hard Case Video box. Mariah Carey - My All - UK Promo Only 1998 3trk Cd Single. Extremely Rare. Mariah Carey - Butterfly - 1997 Japanese Promo Sampler Tour Cd Album.Rare. Fly Away (Butterfly Reprise). Honey - So So Def Radio Mix. The Beautiful Ones. Whenever You Call. Close My Eyes. Mariah Carey Style Magazine SIGNED. Condition is Good. Dispatched with Royal Mail 1st Class signed for Not the best Mariah signature, but a signature none the less. 31cm x 31cm The kind of thing HMV would have had in their windows to advertise a new release. Rare items. Please see pictures for condition. Columbia 662495-4. Columbia 663334-4. Columbia 38T 78276. Columbia 662977-4. Mariah Carey - The Remixes - 2003 Japanese Promo Sampler Cd.Rare. Colour picture sleeve with promo stickered back insert - still factory sealed with intact obi-sticker. SICP-400~401. Through The Rain - HQ2 Radio Edit. Miss You - Featuring Jadakiss. Crybaby - Featuring Snoop Dogg. Mariah Carey - Never Too Far - USA 3trk Promo Only Cd Single. Mariah Carey - Always Be My Baby - 1996 Very Rare 2x7" Vinyl Set. MARIAH CAREY - Always Be My Baby - 1996 USA Columbia Jukebox 7" vinyl single, also including Long Ago, housed in a paper picture sleeve. Columbia 38 78276. MARIAH CAREY - Always Be My Baby - 1996 USA 3trk Promo Only Cd Single RARE. Mariah Carey - I Still Believe- 2XCD Set Plus Promo Standee,Super Rare. P LUS Promo Only Standee. Rainbow - UK 1999 PROMO snippets tape. Side 1 Heartbreaker / Bliss / X-girlfriend / How much. Side 2. Columbia 668301-4. Columbia 38T 79260. Columbia 669058-4. Columbia 38T79338. Mariah Carey - Don't Stop (funkin 4 Jamaica) - 2001 UK Promo Only Video. MARIAH CAREY - Vision Of Love - Spanish 1-sided promo 7", slightly different picture sleeve to other issues. ARIE 2459. 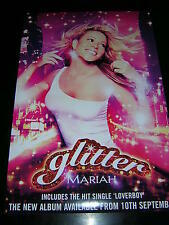 Mariah Carey - Calendar - 2004 Fan Club Only - Still Sealed. T his calendar was only available through "Mariah - Fan Club". M ariah Carey - 2004 Calendar. Mariah Carey - Someday - USA 1990 3trk Promo Only 12"Vinyl Single.RARE. Mariah Carey - Joy To The World - UK 5track Promotional 12”vinyl Single.Rare. Joy To The World - Celebration Mix 7:58. Joy To The World - Flava Mix 7:03. Joy To The World - Club Mix 7:35. Unofficial 1999 Calendar. Sent as a small parcel in a board backed envelope. Mariah Carey - Heartbreaker - UK 1999 7trk 2 X CD Single Set,with Poster. Heartbreaker - Album Version featuring Jay-Z 4:18. Heartbreaker/If You Should Ever Be Lonely - Junior's Heartbreaker Club Mix 10:18. Heartbreaker - Video 5:35. Mariah Carey - Love Takes Time - UK 1990 4trk Picture Card CD Single.RARE. MARIAH CAREY - Emotions - 1991 USA White Label Promo 12”. Superb Item, Rare. Mariah Carey - Emotions - 1991 Original Japanese Picture Disc Cd Album.Rare. To Be Around You. So Blessed. You're So Cold. MARIAH CAREY - Fantasy - 1995 USA - 6trk set. Custom picture sleeve (blue) with lyrics on reverse and custom back insert.CSK7321. MARIAH CAREY - Boy ( I Need You ) - USA 3trk Promo Only Cd Single. Fly Away - Butterfly Reprise. Unofficial 1998 Calendar. Sent as a small parcel in a board backed envelope. Sarah Brightman - La Luna - Taiwanese 5trk Promo Only Sampler.Extremely Rare. Sarah Brightman - La Luna - Taiwanese 5trk Promo only Sampler housed in a Promo only Picture sleeve. 2 - Hijo de la Luna. 5 - La Luna. Mariah Carey - Hero - French Promo Sampler 12" Vinyl. V/A 5 Tracks. Rare. M ariah Carey :- Hero. MARIAH CAREY - Honey - USA promo only 2 x cd 5trk set. These were only sold as part of a limited run on the official Mariah Carey website. 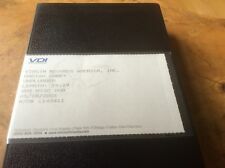 Rare item in very good condition. Minor scuffing as shown in pictures. Item has not been folded. Collection only as it's too difficult to send. I Don't Wanna Cry. Can't Let Go - Edit 3:50. Mariah Carey - Someday - USA 1991 5 Track CD Single.Very Rare. Mariah Carey - My All - Rare Australian 1998 Cd Single With Giant Sticker. My All - 'My' Club Mix. My All - Album Version. Mariah Carey - Rolling Stone - USA 1998 / 2000 Magazine Set. Rare. MARIAH CAREY - Remix Album - 2 X 21trk Cd-r Acetate Set...RARE. (Always Be My Baby (Mr. Dupri Remix feat. Da Brat & Xscape). My All/Stay Awhile (So So Def Remix feat. Lord Tariq & Peter Gunz). Joe & Nas). Honey (So So Def Remix feat. Da Brat & JD). Loverboy (Remix). Official 1998 Calendar. Sent as a small parcel in a board backed envelope. Mariah Carey UNSIGNED photo - M6302 - American singer & songwriter - NEW IMAGE! !